Home > Free Motion Patterns > 21 Two Color Quilts: Free Quilt Patterns, Quilt Block Patterns, and More! Quilting can be an expensive and time-consuming hobby. When patterns calls for several different colors of fabric, the cost can really add up. It's not necessary to include every color under the rainbow to make a pretty quilt. Two color quilt patterns are wonderfully minimalistic because they either only use two colors of fabric, or fabrics with similar hues. We think you’ll love this collection of 21 Two Color Quilts: Free Quilts, Quilt Block Patterns, and More! It’s a mistake to think that two color quilts can only be made in one style. 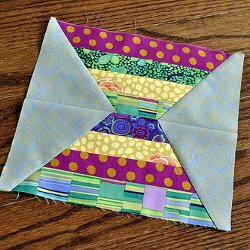 Whether you love to make log cabin quilts or you enjoy paper piecing patterns, two color quilt patterns are awesome because you can still use your favorite quilting techniques. Two color quilts also make great scrapbusting projects. From quilted napkins to lap throws to bed quilts, there are a plethora of quilt projects that you can make from just two colors. Two color quilts also can be much easier on the eyes. When quilts have two many different colors, your eyes don’t know where to look. Two color patterns can help you appreciate the great beauty in simplicity. With these quilt ideas, everyone can focus their attention on the striking patterns that you created rather than being overwhelmed by a chaotic kaleidoscope of colors. These two color quilt block patterns range from classic to unique. You don't need a whole barrel of fabric to be able to come up with a creative quilt block. Whether you make a green turtle or a two tone star, these blocks will add intrigue to your next quilting project. Check out this free eBook, Patterns for Quilting: 8 Free Quilt Block Patterns to Make a Quilt for Your Home, for more quilt block pattern ideas. Two color quilts don't mean black and white and boring. Two color quilts can be made in any size and with a combination of textures. From baby quilts to twin-sized quilts, there's a two color quilt in this list that will look fabulous in your home. If you don't have enough scrap fabric to make a bed-size quilt, you can still make a two color quilt. Get creative and make a baby bib or even a quilted e-reader protective sleeve. Two color pillow patterns and throws also make fabulous home decor accents. Still have more fabric scraps to use up? Look for inspiration for your next scrapbusting project with these Top 20 Free Scrap Quilt Patterns.